Though most people love Miss Piggy for her work as a film star, I have always loved her best as a writer. 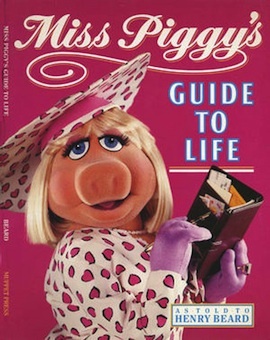 When I was in elementary school, I bought Miss Piggy’s Guide to Life at a library sale in Westport, Connecticut, the posh town where I was born and where my family spent our summers until I was ten years old. The book has been of vital use to me ever since. I was a sturdy child and entered puberty what felt like light years before most of my friends, my thick girl body morphing into a curvy one. Miss Piggy’s womanly advice reached me at a vulnerable moment, when I needed all the help I could get. 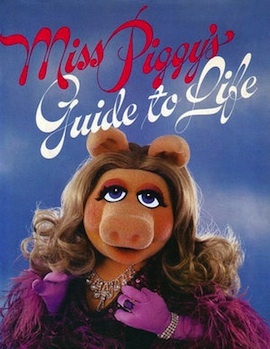 Miss Piggy covers all the bases: romance, finance, diet and exercise, etiquette, and fashion. Though of course the book (“as told to Henry Beard,” and originally published by Knopf in 1981) is intended to be humorous, I think it reads like a rallying cry for the full-figured glamourpuss—that she should love her body and her clothes and her lovers, and, most of all, herself. Miss Piggy is a confident and witty faux-Francophile. She has perfect hair, she wears great dresses, and who cares if she has thick ankles? Certainly not her paramour, Kermit, who would sleep on railroad tracks if she asked. Answers to the Three Most-Often Asked Perfume Questions: How much? A lot. Where? All over. When? Anytime. You can often wash your troubles way with the right kind of bath. Throw everything you have into the tub: bubble gels, bubble oils, bubble powders, bubble gum. And speaking of bubbles, why not have a lovely glass of champagne within easy reach? There is no such thing as a “correct” weight for any particular height—they are only averages. And moi, who has a perfect figure, can tell you that the idea of going on a diet is not to become so thin that when you are at a party and turn sideways, people think you left early. They look for someone feminine, sweet, intelligent, and demure. 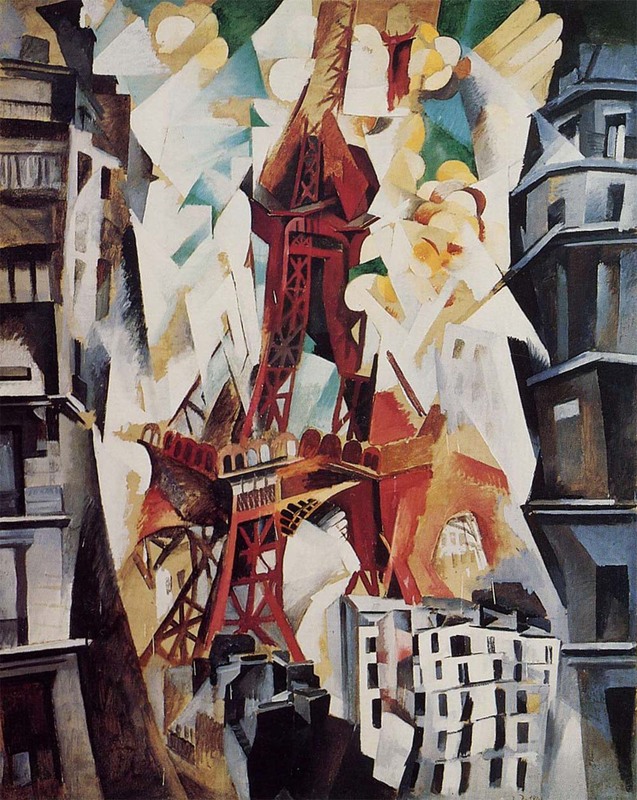 They look for that certain flair, that je ne sais pas. They look for style, substance, and sweep. They look for a full, generous figure coupled with a deep, smoldering gaze. And then, alas, just when they have found it, I must tell them that I am spoken for. Why did Miss Piggy speak to me so clearly, her voice like a beacon in the darkness of adolescence? I think it was because she never apologized for being big and bossy, for having expensive taste, for loving a (very) skinny frog. Looking at her now, I know she’s supposed to be something of a joke, a glutton with a temper problem, but I just can’t see her that way. For me, Miss Piggy will always be the kind of pig I want to meet for tea at the Plaza, dressed to the nines. We all need mentors, and mine happens to be a Muppet. Larry: Did you know that your fiancée, your girlfriend, left home as a teenager, after graduating from charm school? That her first job was at a department store selling gloves? Piggy: I’m proud of that. I was alone. I was single. I’m proud of that. I made my own way. Larry: As a model, she was forced to pose for certain ads—one for a bacon product. Piggy: I’d rather not talk about that. Kermit: That’s outrageous. You never told me that stuff, Piggy. Piggy: This is something a woman sometimes has to do. Like all of us, Miss Piggy had to work her way up the food chain. She had to suffer the indignities of working retail. One can only imagine the gloves that she would help customers try on, knowing full well that they would better suit her own soft, pink arms. But Miss Piggy does not apologize for her humble past, even as she brushes it aside. We have all done things we would rather forget, had episodes we would sooner not rehash in public. I feel pity for all the famous women nowadays who cannot outrun their past foibles because of the pesky Internet, their entire lives following them wherever they go. When Miss Piggy was a young(er) starlet, the past was the past—it didn’t stand in the way of her future. I only want what is best for Miss Piggy, which right now is a big smash at the box office, but my dearest Christmas wish is that soon after the New Year, when we are all trying desperately to be our good, new selves, that she once again returns to her typewriter. The world needs your wisdom, dear Piggy, and so do I.
Emma Straub is the author of the story collection Other People We Married, which will be available from Riverhead Books in February. Follow her on Twitter @emmastraub.